B portion is removed by exocytosis. A separates from B component. Figure 19.12 The Action of A-B Exotoxins The A portion is toxic and the B portion binds to specific receptors on cells. After binding, the A-B molecule is taken up by endocytosis. 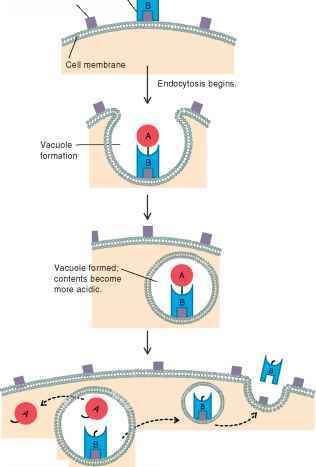 After endocytosis, the contents of the vacuole become more acidic, causing the A and B portions to separate.The B portion remains in the vacuole and is removed by exoccytosis, while the A portion enters the cytoplasm of the cell and exerts its toxic effect.